On the basis of its fiscal solvency in five separate categories, Alaska ranks first among the US states and Puerto Rico for its fiscal health. Given Alaska’s reliance on oil revenues, the state has between 22.46 and 23.44 times the cash needed to cover short-term liabilities. Revenues exceed expenses by 55 percent, producing a surplus of $8,296 per capita. On a long-run basis, net assets represent 85 percent of total assets, and liabilities are 3 percent of total assets. Dependency on oil revenues shows that Alaska’s revenues and spending account for 43 percent and 28 percent of total resident income, respectively. This highlights the risk that, given a decline in oil prices, the state is spending beyond the capacity of residents to pay for current service levels. 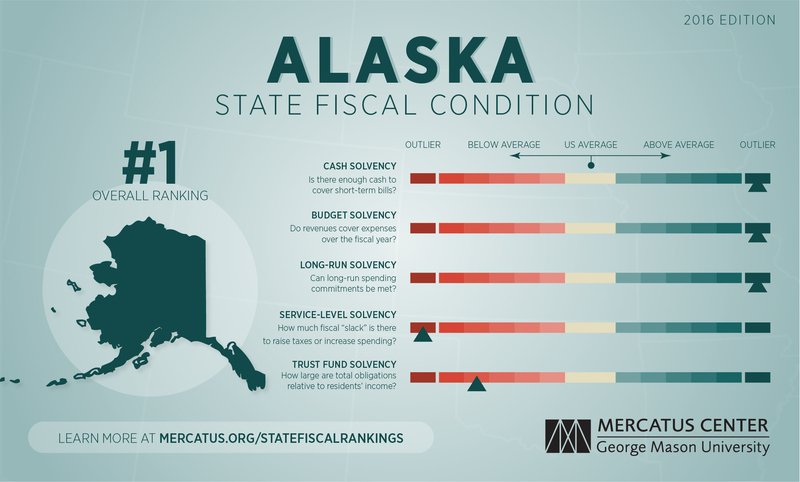 For a complete explanation of the methodology used to calculate Alaska’s fiscal health rankings, download the full paper and the dataset at mercatus.org/statefiscalrankings-2016-edition.